Wicker Park is one of Chicago’s hippest neighborhoods and is the place to go to visit experimental restaurants or shop at exclusive boutiques. Historically, Wicker Park’s residents were mostly Polish but people of all backgrounds call the area home. With vibrant commercial corridors and more places to eat than one could imagine, there’s a ton to do in Wicker Park. Here are eight of the best things to see, drink, eat and do while you’re in the neighborhood. Big Star is easily recognizable by the giant star sign that towers over the gas station-turned-restaurant. Order tacos at the window and enjoy them under partial shade while people-watching. Although you might be too busy chowing down to gaze at passersby. Big Star sells their tacos with more than the traditional cilantro and onion, with toppings like pineapple, pumpkin seeds or stewed mushrooms. In the summer months finding a seat can be difficult so be prepared to take your order to go. While in Wicker Park be sure to make a trip to the park the neighborhood is named after. The 4-acre park has a playground, several community gardens, athletic fields and a historic fountain. In addition to a variety of gardening programs, the park also hosts movie nights, like music performances, farmers markets and more. Enjoy drinks straight from the pre-prohibition era at The Violet Hour. The cocktail list changes seasonally, but the drinks are always fantastic. Choose from one of three candle-lit salons and settle into a high-backed chair while you enjoy your drink. The Violet Hour also offers private and public cocktail classes for guests who’d like to learn about drinks while making them. Milwaukee Avenue is one of several diagonal streets that cut across Chicago’s grid system. 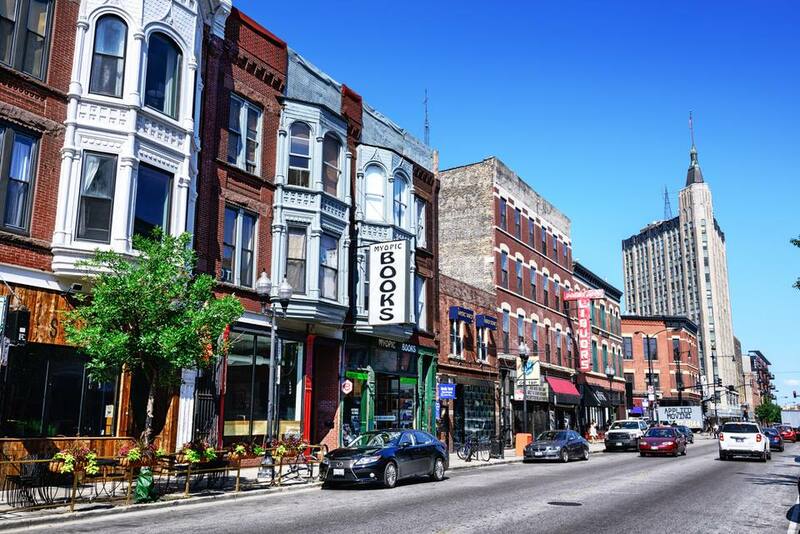 The section of Milwaukee that’s in Wicker Park is filled with unique boutiques, restaurants and cafés. If you’re into vintage clothing then you’re in luck because there are more than five stores along one block including Vintage Underground and Store B. You can enjoy brunch at the popular Bongo Room or get a sweet treat at Jeni’s Splendid Ice Cream. In 2013 Mayor Rahm Emmanuel unveiled the plans to convert the abandoned Bloomingdale Line tracks into a 2.7-mile-long public park. Called The 606 in honor of Chicago-land area codes, the park host various events throughout the year and there are a myriad of permanent and temporary art installations along the trail. The stretch of the 606 trail in Wicker Park is also called the Bloomingdale Trail and is considered the heart of the 606. Friends of the Bloomingdale Trail runs 75-minute tours of the West End or the East End on select dates. Play games and drink some beers at Emporium Wicker Park. Almost 50 arcade games, 14 pinball machines and two skeeball lanes fill Chicago’s first arcade bar. There are more than 20 beers on tap, plus a rotating cocktail menu, so there’s plenty to drink while you play. In addition to the games there are also live music performances and DJs providing a lively soundtrack to your night. Be sure to grab a picture in the photo booth to commemorate your time at Emporium. The brainchild of best friends, Derrick Robles and John Latino, The Bongo Room first opened in 1993 on Damen Avenue. While the restaurant is now located on Milwaukee Avenue the mission to provide seasonal and unique breakfast and brunch food is the same. The pancake and French toast options change regularly but there are some favorites always on the menu like the breakfast burrito or vegetarian croissant sandwich. Chicago winters can be truly bone-chilling, but what better to warm you up that a mug of hot chocolate? Mindy’s Hot Chocolate offers seven different delicious cocoas that are all served with a house made marshmallow. If you’re in the mood for something boozy, you can customize a mug of cocoa spike with either brandy, whisky, rum or cognac. Or if you want something to eat with your drink there’s full brunch, lunch, dinner and dessert menus.